Spanning valleys and waterways, bridges perform a basic but essential function: getting us from one side to the other. But what if we expanded on that purpose, inserting everything from opera halls and vertical gardens to entire cities into the design? 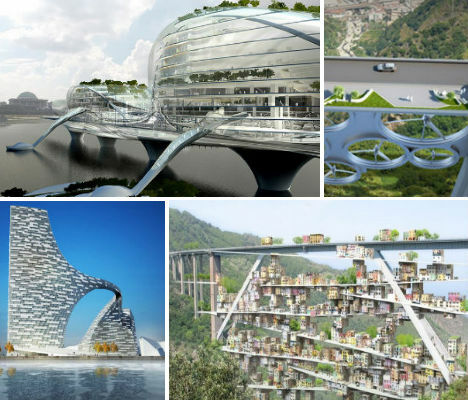 These 13 bridge concepts stretch beyond the boundaries of traditional design, creating bridges that are multi-purpose or simply astonishingly unusual. Why should bridges be limited to traffic alone? 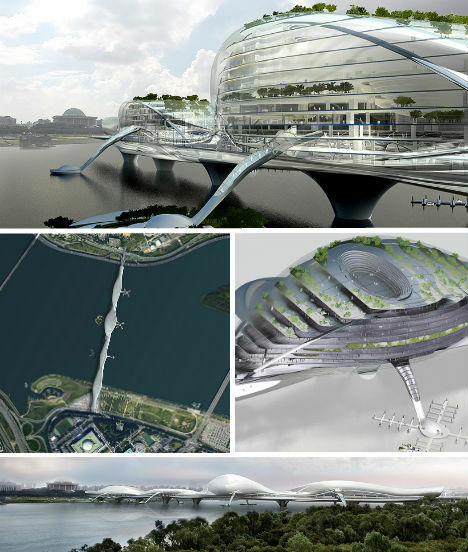 This incredible concept for the Han River in Seoul imagines the bridge as an essential part of the city itself, filled with activity and attractions including a museum, library, and IT offices. People can even arrive via water taxi. The design, by Planning Korea, has a ‘skin’ covered in solar panels that would also function as a massive canvas for art and videos. 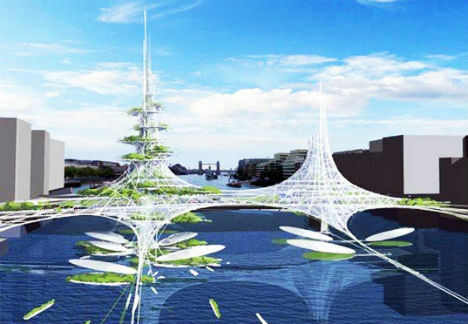 Could bridges, which are often positioned over waterways that could act as wind corridors, be used to harvest energy? 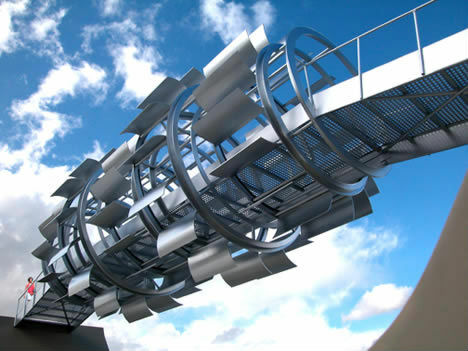 This concept by Michael Jantzen puts a footbridge to work, equipping it with a series of turbines that turn around pedestrians as they walk through it. London Bridge has been reincarnated several times already, and someday soon, it will be due for a refresh. Will the 21st-century version be a vision of sustainable urban living, with solar-powered spires covered in vertical farms towering into the air? Chetwood Architects’ proposal would harness solar and wind power, collect rainwater, grow and sell food and even house markets, cafes, restaurants and residences. 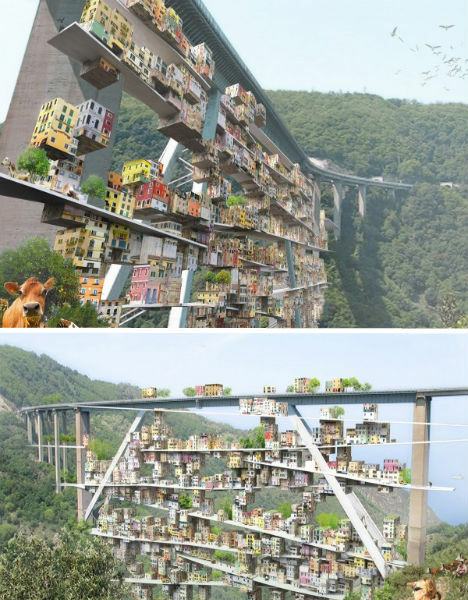 Those afraid of heights would want to steer clear of this city-in-a-bridge concept by Ja Studio, modeled after the Ponte Vecchio in Florence. 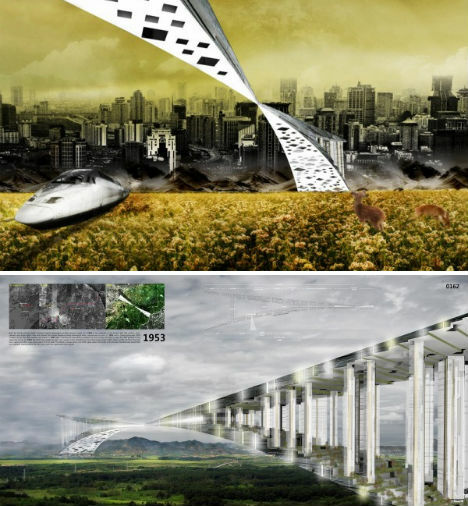 Created for a contest that aims to identify a creative new use for a decommissioned highway between Salerno and Reggio Calabria in Italy, the proposal places a precarious new urban center onto existing infrastructure to not only provide amazing views but have a small impact upon the ecology of the surrounding landscape. At the Hoover Dam, the sheet of water pouring over a face of simple concrete is without a doubt the main attraction. Can you imagine if instead it looked like this, with the water entering a series of containers “to engage directly with visitors?” Designer Yheu-Shen Chua gives the iconic structure a shockingly futuristic makeover that would certainly be controversial if it ever saw the light of day. 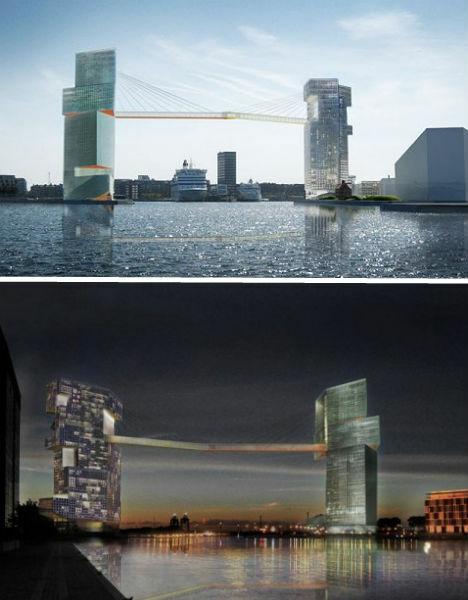 First prize winner in a competition to design a new harbor entrance to the city of Copenhagen and recipient of the 2010 Progressive Architecture Award, ‘LM Harbor Gateway’ by Steven Holl Architects features two towers, each with its own cable-supported bridge, meeting in the middle in an arrow shape reminiscent of the prow of a ship. The bridge serves as a passageway between two piers and as a public overlook, and the towers contain public facilities like cafes and galleries. 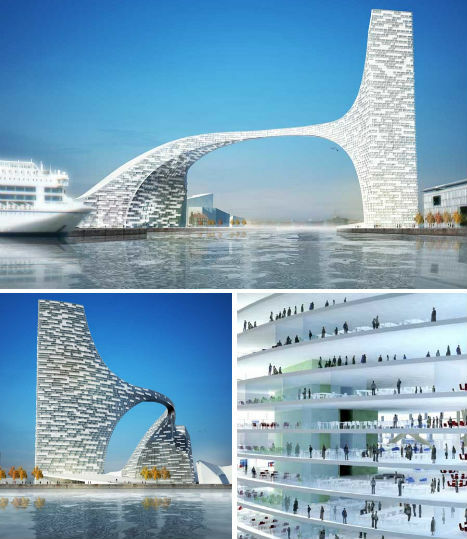 Another proposal for the Copenhagen harbor, designed by 3XN Architects, takes an entirely different tact. As curvilinear as the Holl design is geometric, the ‘CPH Arch’ – which serves as an office tower – is a single seamless volume teeming with movement and activity. Peaceful reunification of the two Koreas is the dream of many – but if and when it does happen, environmentalists hope that the 50-mile buffer zone between the two countries will remain as it is. Untouched for 50 years, the Demilitarized Zone (DMZ) is one of the world’s most pristine ecological environments and contains half of the Korean Peninsula’s wildlife. 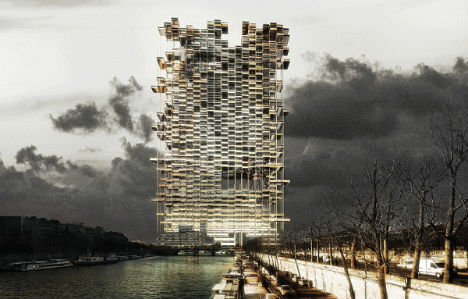 With this in mind, Korean architects Kim Sehyeon, Lee Jung Boram and Choung Yongsu have proposed a skyscraper bridge packed with meeting halls and meditation areas where citizens of both countries could meet. 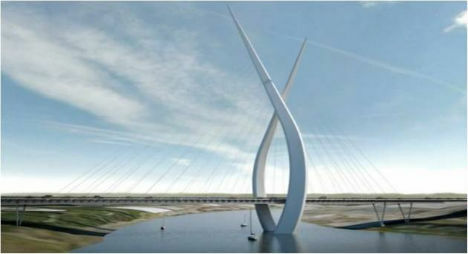 This innovative design, created for the River Wear in Sundlerland, could become the UK’s tallest bridge at over 519 feet. Two curved spires cross in the air, supported by cables, in a striking silhouette that will undoubtedly become a local landmark. The status of the project is unclear, but assuming that funds are available, construction is due to start in 2012 with an anticipated completion date in 2015. 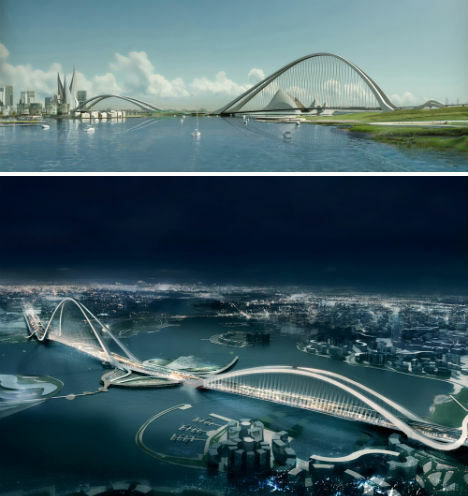 It seems that Dubai has been on a quest to produce the biggest, most jaw-dropping architectural projects in the world, so it’s no surprise that they’re currently constructing the world’s longest and tallest arch bridge. The design, by NYC firm FXFowle, seems to flout the laws of physics. 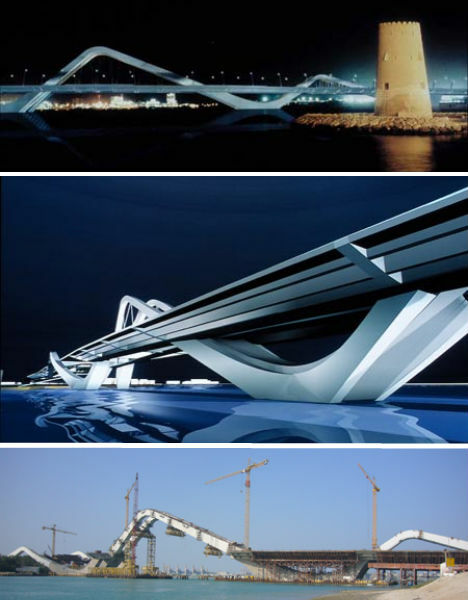 It may look like the kind of design that’s destined to remain a concept forever, but the Sheikh Rashid bin Saeed Bridge is due for completion in 2012. It’ll have 12 passenger lanes, a dual rail track for Dubai’s Metro Green Line and a man-made island with an opera house, and will carry some 20,000 vehicles per hour. Large-scale wind power may necessitate putting turbines in unexpected places – including, perhaps, over rivers and valleys that are often wind corridors. 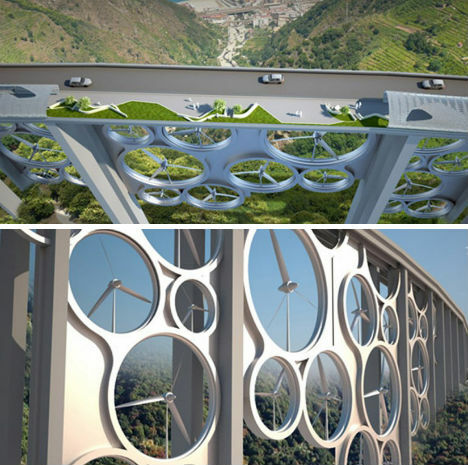 So even if this particular design for a wind turbine bridge – which also has a grid of solar cells embedded on the surface of the road – isn’t entirely realistic, it’s an interesting concept. 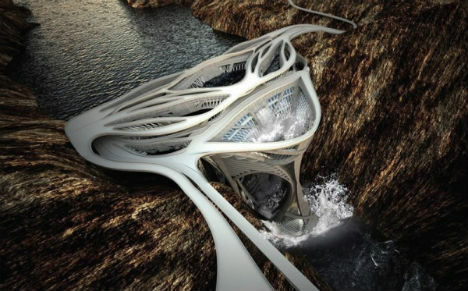 The designers say the bridge could power as many as 115,000 homes. Asymmetrical steel arches form a wave-like design, emerging from cantilevered road decks on either side, in this design for Dubai’s Sheikh Zayed Bridge by Zaha Hadid. The architect believes that the bridge, a part of a major four-line highway connecting Abu Dhabi island to the mainland, will become a destination in itself. It’s currently under construction.